Almost all humans with homozygous deficiency of C1q develop systemic lupus erythematosus (SLE). The precise cellular mechanism(s) by which C1q prevents the development of SLE remains unclear. In this study, we tested the role of C1q in the regulation of IFN-α induced by immune complexes (ICs) in vitro, as well as the consequences of lack of C1q in vivo. 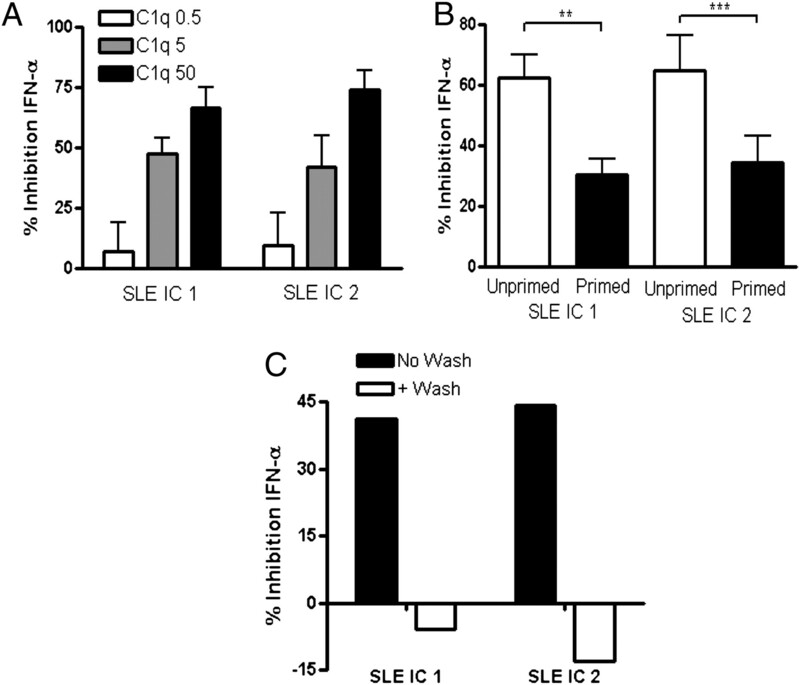 Our experiments revealed that C1q preferentially promotes the binding of SLE ICs to monocytes rather than plasmacytoid dendritic cells, but this inhibition was not due to the induction of inhibitory soluble factors. The presence of C1q also altered the trafficking of ICs within monocytes such that ICs persisted in early endosomes. In patients with C1q deficiency, serum and cerebrospinal fluid levels of IFN-α and IFN-γ–inducible protein-10 levels were elevated and strongly correlated with Ro autoantibodies, demonstrating the clinical significance of these observations. These studies therefore associate C1q deficiency with defective regulation of IFN-α and provide a better understanding of the cellular mechanisms by which C1q prevents the development of IC-stimulated autoimmunity. Systemic lupus erythematosus (SLE) is a polygenic disease caused by the interaction of multiple genetic variants (reviewed in Ref. 1), which, in combination with exposure to environmental factors, leads to the development of autoantibodies to self nucleoproteins. Although very rare, loss of function mutations in a single gene, C1q, the first protein of the classical complement pathway, is sufficient to cause SLE in >90% of individuals with these mutations (reviewed in Ref. 2). C1q deficiency (C1qD) is the strongest known susceptibility factor for the development of SLE identified to date, and C1qD patients usually have more severe disease manifestations (2). Whereas homozygous C1qD is rare, many SLE patients without C1q gene mutations have reduced serum C1q activity due to increased consumption and/or neutralization of function by anti-C1q autoantibodies (3, 4). Interestingly, 53–92% of SLE patients were reported to have low levels of C1q during active disease and especially glomerulonephritis (5–8), which is also a time of increased type I IFN activity (see below) (9–12). C1qD also causes a lupus-like disease in certain strains of mice, but with lower penetrance compared with humans (13). Several explanations for the strong association between C1qD and SLE have been proposed (reviewed in Ref. 14). These include increased infection, defective clearance of immune complexes (ICs) or apoptotic cells (waste disposal hypothesis), and inadequate tolerization of immature B cells. Because C1q binds to the Fc portion of aggregated IgG and IgM in ICs as well as to apoptotic blebs, loss of C1q impairs these clearance mechanisms, leading to increased IC deposition and tissue damage as well as the release of additional autoantigens. There is growing evidence that most SLE patients have been exposed to type I IFNs (IFN signature) and that type I IFN levels correlate with disease activity (9–11). At least one explanation for abnormal IFN-α production in SLE patients is that ICs containing (ribo)nucleoproteins are endocytosed by plasmacytoid dendritic cells (pDCs), and the nucleic acids in these ICs stimulate TLR 7 or 9, leading to transcriptional activation of type I IFN-α (reviewed in Ref. 15). We recently observed that normal human serum (NHS) contains inhibitory factors that potently downregulate SLE IC-induced IFN-α production by pDCs (16). We identified IgG as one factor involved in this regulation, but recognized that other serum components were involved as IgG depletion/deficiency did not completely abrogate serum-inhibitory activity. Considering the strong association between C1qD and SLE as well as the important role of IFN-α in the pathogenesis of SLE, we tested whether C1q itself is an additional serum protein that regulates IFN-α induced by SLE ICs. We observed that C1qD patients have elevated serum levels of IFN-α and IFN-γ–inducible protein-10 (IP-10), and we found that C1q is required for inhibition of IFN-α production by pDCs through an indirect mechanism involving CD14+ monocytes. These observations provide a novel potentially causal link between C1qD and the development of SLE. Affinity-purified SmRNP Ag was obtained from Arotec Diagnostics (Wellington, New Zealand) and labeled with Alexa Fluor 647 with a microscale kit from Invitrogen (Carlsbad, CA). C1q-depleted serum and C1q protein were purchased from Complement Technology (Tyler, TX) or Quidel (San Diego, CA), but Complement Technology products were used in most experiments. C2-depleted serum was obtained from Quidel. All reagents had <0.06 EU/ml endotoxin by Limulus amebocyte lysate clot assay (Associates of Cape Cod, East Falmouth, MA). L-NG-Nitroarginine methyl ester was from BIOMOL International (Plymouth Meeting, PA). Catalase and superoxide dismutase were purchased from Sigma-Aldrich (St. Louis, MO). Anti–BST-2 mAb and the blood dendritic cell Ag (BDCA)-2–expressing NFAT-GFP hybridoma reporter cell line (17) were provided by Y.-J. Liu (University of Texas MD Anderson Cancer Center, Houston, TX). All SLE patients fulfilled the American College of Rheumatology 1982 revised criteria for the classification of SLE (18). Clinical manifestations, SELENA-SLEDAI scores (19), autoantibodies, and serum levels of C1q, C3, C4, IFN-α, and IP-10 for each C1qD family member are outlined in Table I, and this family was originally described previously (20). The number of American College of Rheumatology criteria (in parentheses) for each patient was as follows: C1qD patient 1 (4), C1qD patient 2 (6), C1qD patient 3 (2), and C1qD patient 4 (1); therefore, two of four C1qD patients have fully developed SLE (four or more criteria). Cerebrospinal fluid was collected from C1qD patient 2 in 2007 at the time when the patient had CNS disease. C1q levels were measured by radial immunodiffusion, and the results were expressed as a percentage of a reference NHS (normal range 70–120%). Complement C3 and C4 levels were measured by rate nephelometry using an IMMAGE 800 nephelometer (Beckman Coulter, Fullerton, CA) calibrated against the international reference preparation CRM470 (normal ranges: C3 = 0.83–1.46 g/l; C4 = 0.15–0.52 g/l). Total complement hemolytic activity (CH50) in serum was quantified using sensitized sheep RBCs, as described (21). The degree of hemolysis was expressed in CH50 U, in which 80–160 CH50 U/ml is considered normal. Normal cerebrospinal fluid was purchased from Arotec Diagnostics. All samples were collected with the respective institutions review board approval. Autoantigen arrays were performed and analyzed, as described previously, using a panel of recombinant or native proteins (22). Arrays were probed with sera or cerebrospinal fluid at a 1:250 dilution, and bound Abs were revealed using IgG-specific secondary Abs conjugated to fluorophores. The signal intensities obtained were normalized to the signal of Abs bound to the anti-human IgG capture Ab printed at 22.5 μg/ml concentration, and hierarchically clustered by sample based on Euclidean distance with average linkage (23). SmRNP, Ro, or La autoantibody levels in patient sera were also quantified using a QUANTA Plex ENA Profile 5 kit (INOVA Diagnostics), according to manufacturer’s instructions. Patient serum and cerebrospinal fluid IgG were quantified using a sandwich ELISA with Abs and human IgG standard from Jackson ImmunoResearch Laboratories (West Grove, PA). dsDNA autoantibody levels in patient sera were quantified using a kit from Trinity Biotech, according to the manufacturer’s instructions. The normal range is <8 IU/ml. IFN-α and IP-10 concentrations in patient sera or cerebrospinal fluid were quantified by Searchlight Custom Multiplex Protein Array (Aushon BioSystems) with a sensitivity of 0.8 and 2.8 pg/ml, respectively. PBMCs were prepared from healthy human donors using Ficoll-Paque density gradient centrifugation. In almost all cases, a different healthy donor was used for each independent experiment. In certain experiments, monocytes, B cells, or NK/NKT cells were depleted with CD14-magnetic beads or CD19-PE or CD56-PE with anti-PE beads, respectively. Each depletion left <0.05–0.6% of the respective cell type remaining in PBMC cultures, and each sample was carefully analyzed to confirm that other cell types were not nonspecifically depleted. As an additional control, PBMCs were mock depleted by only adding anti-PE beads without a PE-labeled Ab. pDCs were purified from PBMCs by negative selection using a pDC isolation kit, according to manufacturer’s instructions (Miltenyi Biotec, Auburn, CA, or StemCell Technologies, Vancouver, Canada), with purities of 94–99% in each experiment. Monocytes were purified from PBMCs by positive selection with CD14-magnetic beads (Miltenyi Biotec), with consistent purities of >95%. The bioassay for IFN-α production in response to SLE ICs was performed with normal PBMCs (5 × 105/well) left unprimed or primed with type I IFN and GM-CSF, as previously described (16, 24). High dilutions (1:2000) of SLE serum or purified SLE IgG (75–150 μg/ml) were used as a source of autoantibodies, and freeze-thawed U937 cells (1–2% v/v) were used as autoantigen, as described (16, 24). Diluted SLE serum was used to form ICs in all experiments except in Fig. 3B. After testing multiple doses of purified C1q, we chose a dose of 40–50 μg/ml in our inhibition experiments as that dose gave similar inhibition percentages in multiple donors. In our culture system, IFN-α is only produced by pDCs as Abs to BDCA-2–abrogated IFN-α production, as described previously (25), and IFN-α was not detectable in pDC-depleted PBMC or purified monocyte cultures (data not shown). When purified pDCs (1 × 104–1.5 × 104) were used as responders either alone or when cocultured with monocytes, IL-3 (10 ng/ml; PeproTech, Rocky Hill, NJ) was added to prevent apoptosis (26). IL-3 did not significantly affect IFN-α production (data not shown), in agreement with a previous publication (27). In addition, C1q inhibition of IFN-α was comparable between unprimed and IL-3–treated PBMCs (data not shown). U937 cells were determined to be free of mycoplasma contamination using e-Myco Mycoplasma PCR detection kit (iNtRON Biotechnology), and extracts had <0.06 EU/ml endotoxin by Limulus amebocyte lysate clot assay. Toxicity of added inhibitors was monitored by flow cytometry with LIVE/DEAD I/R (Invitrogen). IFN-α levels in supernatants were quantified by ELISA using commercially available Abs, as described (16). In view of donor to donor variation in circulating pDCs (0.1–0.7% of PBMC) with resulting differences in IFN-α production, for most experiments the results are expressed as percentage of inhibition of IFN-α relative to cells that did not receive the inhibitor being tested. However, the results are also expressed as total pg/ml cytokine induced as raw data in the Supplemental Figures. A negative percentage of inhibition indicated that the inhibitor being tested actually enhanced IFN-α induction. TNF-α and IL-10 were measured in supernatants by ELISAs with Ab pairs from Biolegend (San Diego, CA) or eBioscience (San Diego, CA). PGE2 was measured with an ELISA kit from Assay Designs (Ann Arbor, MI). To physically separate monocytes and pDCs, we used a 24-well transwell insert (Corning Glass, Corning, NY) with 0.4-μm pores. Because of the larger number of cells needed to keep cell density similar to the 96-well format in previous experiments, monocyte-depleted PBMCs were used as a source of pDCs, and pDC-depleted PBMCs as a source of monocytes. In the “separated” condition, 5 × 105 monocyte-depleted PBMCs were plated on top, whereas 1.5 × 106 pDC-depleted PBMCs were plated on bottom. The “together” condition had the same number of each set of cells plated together in the bottom of the transwell plate. SLE ICs were added simultaneously with C1q (40 μg/ml) and supernatants collected after 20 h of stimulation. IFN-α was measured, as described above. For supernatant transfer experiments, ICs alone, ICs with C1q (50 μg/ml), or C1q alone was added to pDC-depleted PBMCs (5 × 105/well) or purified monocytes (2 × 105/well) for 4 h, and then cells were washed extensively to remove unbound ICs and C1q. Supernatants were collected after an additional 20 h in culture at 37°C and added to fresh PBMCs (60% v/v), which were then stimulated with ICs for 20 h.
ICs were formed with SLE patient sera diluted 1:500 and Alexa Fluor 647-labeled SmRNP autoantigen for 30 min at room temperature. ICs were added with or without C1q protein at various doses to total PBMCs or purified pDCs with or without monocytes at various ratios. After 2 h (4°C or 37°C), cells were washed and surface stained to identify pDCs (BDCA-2+, CD123+) or monocytes (CD14+) and analyzed by flow cytometry. The IC binding (percentage of IC+) was calculated relative to adding the autoantigen alone. The background of SmRNP binding to cells did not increase by adding C1q (data not shown). In certain experiments, Abs to FcγRII (CD32) (clone AT10; AbD Serotec, Oxford, U.K.), CD93 (clone R139 or R3; provided by A. Tenner, University of California, Irvine, Irvine, CA), calreticulin (cC1qR) (clone 1G11-1A9 or goat polyclonal; AbDSerotec), α2β1 integrin (clone 6F1′ provided by B. Coller, Rockefeller University, New York, NY), or gC1qR (clone 60.11; Santa Cruz Biotechnology, Santa Cruz, CA) were added to PBMCs for 45 min before addition of SLE ICs in the presence or absence of C1q. In each experiment, isotype controls were added for direct comparison, as follows: mouse IgG1 (CD32, cC1qR, gC1qR, α2β1), mouse IgG2b (CD93 R139), mouse IgM (CD93 R3), or goat serum (cC1qR). SLE ICs were formed with Alexa Fluor 647-labeled SmRNP autoantigen as above and added to purified monocytes for 1 or 4 h at 37°C. Monocytes were then surface stained with anti-human CD14 Pacific Blue (Biolegend), fixed, and permeabilized for intracellular staining. Abs to CD71 (FITC) and lysosomal-associated membrane protein-1 (Alexa Fluor 488) were used to stain early endosomes and lysosomes, respectively (Biolegend). Cells were analyzed using an ImageStream flow cytometer (Amnis, Seattle, WA) and IDEAS image analysis software package. Between 5,000 and 20,000 images per sample were collected, and single-color compensation controls were used to generate a compensation matrix that was applied to the image data to correct for spectral crosstalk. Each data file was then processed through a single template with a consistent gating strategy that first identified single cells (by area aspect ratio), in focus cells (by gradient root mean square of the brightfield image), internalized ICs (using the internalization feature), and finally events positive for both IC and endosome or lysosome fluorescence (using the Intensity FITC/488 versus Intensity AF647). Once the final analyzable population was found, colocalization of ICs to either the endosome or the lysosome was quantified using the bright detail similarity (BDS) feature (28). BDS uses a modified nonmean-normalized Pearson’s correlation coefficient to effectively quantify the degree of similarity between the IC AF647 image and the endosome or lysosome image. When the IC is internalized and colocalized to the endosome/lysosome, it will receive a high BDS value. A region identifying cells with BDS values >2 was drawn, and the percentage of cells in that colocalized region was calculated in each independent experiment. There was no significant correlation between the intensity of the ICs within monocytes and the percentage of colocalization of ICs with early endosomes/lysosomes (data not shown). Statistical significance between groups was determined by Mann-Whitney U test, unpaired/paired t test, or one-way ANOVA (with Tukey multiple comparison posttest), where appropriate. Correlations between parameters were assessed using the Pearson correlation analysis and linear regression analysis. A p value <0.05 was considered significant. Graphs and statistical analyses were performed using Prism software (version 4; GraphPad Software, San Diego, CA) or Sigmastat (version 3.11; Systat Software, Evanston, IL). We previously reported that normal serum contains factors that potently inhibit IFN-α production by pDCs in response to stimulation by SLE ICs containing nucleoprotein Ags (16). Because we observed that heat inactivation (HI; 56°C for 30 min) significantly decreased serum-inhibitory activity (Fig. 1A), we inferred that complement might play a critical role in inhibition of IC-stimulated IFN-α production. To determine what effect complement inactivation would have on IFN-α induction by SLE patient sera, we compared IFN-α induction with and without HI by eight consecutive lupus sera that induced IFN-α. HI induced a marked increase (range: 2.5- to 18.9-fold, p < 0.05) in IFN-α induction by these SLE sera compared with paired unmanipulated serum (Fig. 1B). Of interest, the one SLE patient serum that did not show an increase in IFN-α induction following HI had very low complement activity (28 CH50 U/ml). Having shown with normal as well as SLE serum that complement inactivation significantly abrogates its inhibitory activity, we next asked whether C1q was specifically required for serum-inhibitory activity because C1qD has the highest penetrance for susceptibility to SLE (2). Compared with normal or C2-depleted serum, C1q-depleted serum was significantly less inhibitory at each concentration tested (the percentage of inhibition is shown in Fig. 1C, and the raw data in Supplemental Fig. 1A). Add back of C1q (that reconstituted CH50 levels to normal; data not shown) also restored inhibition to levels similar to those seen with normal serum (Fig. 1D, Supplemental Fig. 1B), confirming that the effect observed was due to the missing protein. C1q-depleted serum from two different companies and reconstitution with native, but not boiled or HI, C1q protein from two commercial sources (>95% pure as determined by SDS-PAGE and Coomassie blue staining) gave similar results, demonstrating that active C1q is required for inhibition (Supplemental Fig. 1C and data not shown). When C1q-depleted serum was HI and tested for inhibitory activity in the PBMC bioassay, no statistically significant difference in inhibitory activity was observed (Supplemental Fig. 1D), indicating that C1q and downstream pathways initiated by C1q constituted the majority of the inhibitory effect. It is unclear why HI of C1q-depleted serum did not further reduce its inhibitory activity. C1q is required for serum inhibition of IFN-α induced by SLE ICs. A, SLE ICs were formed with diluted SLE serum (1:2000) and freeze-thawed Ag (1%) and added to IFN-primed PBMCs (IFN bioassay). Untreated or HI NHS was added at the time of IC addition at the concentrations indicated. B, Eight SLE sera were left untreated or HI and added with freeze-thawed Ag to IFN-primed PBMCs, as in A. Results are representative of two donors tested with all serum IC stimulations on the same day. Horizontal lines represent mean pg/ml IFN-α induced. The dashed line represents one SLE patient with low serum complement activity. C, The IFN bioassay was performed in the presence of NHS, C1q-depleted serum, or C2-depleted serum at the concentrations shown. D, The IFN bioassay was run in the presence of NHS or C1q dep serum reconstituted with purified C1q protein, as shown (hatched bars). IFN-α was quantified in supernatants by ELISA after 20 h and expressed as pg/ml or percentage of inhibition of IFN-α production relative to cells that were not treated with serum. Results are shown as the mean ± SEM of 3–13 (A), 3–12 (C), or 9–11 (D) independent experiments. *p < 0.05; **p < 0.01; ***p < 0.001. C1q dep, C1q depleted; C2 dep, C2 depleted. Because the inhibition experiments to date had been performed with whole serum, we asked whether isolated C1q could exert a direct inhibitory effect on IFN-α production in response to ICs. When isolated C1q was coincubated with SLE ICs and added to unprimed PBMC cultures, IFN-α production was inhibited in a dose-dependent manner (Fig. 2A, Supplemental Fig. 2A). Similar results were observed using SLE ICs generated with seven additional SLE patient sera (data not shown). Interestingly, the C1q-inhibitory effect was more marked on unprimed cells compared with cells that were primed with type I IFN and GM-CSF (Fig. 2B, Supplemental Fig. 2B). C1q inhibition experiments were therefore conducted in unprimed conditions that reflect initial exposure of normal cells to ICs. No increase in pDC cell death was observed following the addition of C1q, indicating that reduction in IFN-α production was not due to toxicity (Supplemental Fig. 3A). Importantly, C1q had to interact with the SLE ICs to mediate its inhibitory effect as preincubation of C1q with PBMCs for 4 h, followed by washing and addition of SLE ICs, completely abrogated inhibition of IFN-α (Fig. 2C). Consistent with this data, when both C1q and ICs were added for 4 h before the wash, C1q was still able to inhibit IFN-α induction, although slightly less so compared with not washing cells (data not shown). Together, these findings strongly suggest that direct interactions between C1q and ICs are necessary for the inhibitory activity observed. C1q itself inhibits IFN-α through interaction with SLE ICs at the time of stimulation. A, The IFN bioassay was performed as in Fig. 1, except that the PBMCs were not primed, and purified C1q (0.5–50 μg/ml) was added to the culture. B, C1q (50 μg/ml) was added to PBMCs that were either unprimed or IFN primed in the IFN bioassay. C, Isolated C1q (50 μg/ml) was added to unprimed PBMCs for 4 h at 37°C. All cells, even those not treated with C1q, were then extensively washed (+ Wash), SLE ICs were added, and the supernatants were collected after 20 h. In comparison, C1q was added simultaneously with ICs with no washing (No Wash). IFN-α was quantified and expressed as percentage of inhibition, as described in Fig. 1. Results are shown as the mean + SEM of four to seven independent experiments. Results in C are representative of four independent experiments. Data are shown with SLE ICs formed from two different patients’ serum in each figure (SLE ICs 1 and 2). **p < 0.01; ***p < 0.001. Because normal serum that had been depleted of C1q exhibited poor IFN-α–inhibitory activity in response to SLE ICs, we asked whether the same defect was present in serum from individuals with homozygous C1qD. Serum was therefore obtained from a family previously reported (20) with four affected (C1q < 10% normal levels) and one unaffected sibling (Table I) and tested for IFN-α–inhibitory activity in comparison with normal donor controls. In agreement with the results described to date, serum from the four family members with C1qD exhibited a substantially reduced inhibitory effect on IFN-α induction by SLE ICs, whereas the unaffected sibling’s serum suppressed IFN-α to the same extent as normal serum (Fig. 3A). These results could not be readily explained by serum IFN-α or IFN-α–inducing effects of the C1qD sera themselves, because at 1:20 dilution (5%), none of these sera induced IFN-α in vitro (data not shown), and 5% serum contained <5 pg/ml IFN-α (see below). In addition to generating SLE ICs with diluted patient serum, we also generated ICs with purified SLE IgG (total IgG fraction) to confirm that inhibition was not explained by other proteins present in serum at 1:2000. SLE IgG ICs were incubated with PBMCs in the presence of either C1qD patient serum or serum from the unaffected sibling. Consistent with results using 1:2000 dilutions of SLE serum, purified SLE IgG ICs induced much higher levels of IFN-α in the presence of serum from C1qD patients compared with their unaffected sibling (Fig. 3B). A similar result was observed when SLE ICs were formed with purified SmRNP autoantigen instead of total cell extract and when additional patient SLE ICs were formed with IgG concentrations as low as 5 μg/ml (data not shown). C1q-deficient patient sera fail to inhibit IFN-α induction by SLE ICs and contain elevated levels of IFN-α and IP-10 that strongly correlate with Ro autoantibodies. A, Serum from normal or from siblings with (C1qD 1–4) or without (unaffected) C1qD was added (5% v/v) to the IFN bioassay in the presence or absence of purified C1q (5 μg/ml). IFN-α was quantified by ELISA and expressed as percentage of inhibition, as in Fig. 1. Results are representative of three to four independent experiments. B, SLE ICs were formed with purified SLE IgG (75 or 150 μg/ml) and freeze-thawed Ag (2% v/v), and then incubated with unaffected or C1qD sibling sera (patient 3 or 4, 5% v/v) and IFN-primed PBMCs. IFN-α was quantified by ELISA after 20 h. Results are representative of two independent experiments. C and D, IFN-α (C) and IP-10 (D) were quantified in sera or cerebrospinal fluid from normal, C1qD patients or their unaffected sibling, as described in Materials and Methods. The correlation between IFN-α and IP-10 levels in sera was statistically significant (Pearson correlation coefficient r = 0.9769, p = 0.004). E, Serum IFN-α levels and autoantibodies in patient sera or cerebrospinal fluid were measured by ELISA or autoantigen array, respectively, as described in Materials and Methods. A positive control of pooled autoreactive sera and a negative control of buffer alone were also included. Normalized MFIs for each autoantigen were calculated by dividing by the IgG concentration in each patient’s serum (mg/ml). Pearson correlation coefficients (r) are indicated with p values for only those correlations that were statistically significant. The diagonal lines show linear regression. bRo/SSA refers to purified bovine autoantigen, whereas Ro/SSA refers to recombinant human protein. N, normal; n.s., not significant; Unaff, unaffected. If, as hypothesized, lack of C1q predisposes to enhanced IFN-α in response to ICs, then the C1qD patients would be expected to have higher serum concentrations of IFN-α compared with their C1q-sufficient sibling and normal controls. As shown in Fig. 3C, all C1qD patient sera had detectable levels of IFN-α, whereas the sibling with normal levels of C1q had undetectable levels of IFN-α (Table I). This is different from SLE patients who rarely have detectable levels of IFN-α, and IFN exposure in 42–93% of patients is detected by upregulation of IFN-stimulated genes (the IFN signature) (9–11). In addition, three C1qD patients had elevated serum levels of IP-10 (Fig. 3D) an IFN-α–associated biomarker for SLE (29). There was a strong correlation between IP-10 and IFN-α levels in C1qD patient serum (r = 0.977, p = 0.004). Of particular interest relevant to our previous observation that cerebrospinal fluid from patients with neuropsychiatric lupus are extremely potent at inducing IFN-α (16), we observed that cerebrospinal fluid obtained from C1qD patient 2 at the time of CNS disease (encephalopathy associated with small vessel vasculitis; see Ref. 20) had very high cerebrospinal fluid concentrations of IFN-α. Using a sensitive Ag array, we detected multiple anti-RNA–associated autoantibodies in C1qD patients' serum and cerebrospinal fluid (C1qD 2) (Fig. 3E). Of ∼200 autoantigens interrogated, only two specificities (Ro/SSA, 52 and 60 kDa) significantly correlated with both IFN-α and IP-10 in serum (p < 0.05). Anti-Ro/SSA autoantibodies were also detected in the sera of C1qD patients 1 and 2 by multiplex assay (data not shown). Together, these findings support the notion that C1qD results in a failure to suppress IFN-α in response to anti-RNP containing ICs. We next addressed the question as to how C1q specifically alters the IC induction of IFN-α by pDCs. pDCs were isolated from normal donors, and IFN-α production in response to IC stimulation in the presence or absence of C1q was compared. Surprisingly, addition of C1q to SLE ICs enhanced IFN-α production by purified pDCs (Fig. 4A), an effect that was independent of pDC survival (Supplemental Fig. 3B). We observed this phenomenon in pDCs from 12 different normal donors using 7 different SLE ICs. Thus, C1q likely does not inhibit SLE IC-induced IFN-α production via direct effects on pDCs. CD14+ monocytes are required for C1q-dependent inhibition of IFN-α. A, SLE ICs with or without purified C1q (50 μg/ml) were incubated with isolated pDCs and IFN-α quantified after 20 h. The results are expressed as IFN-α concentration (mean ± SEM of 4 [SLE IC 1] or 9 [SLE IC 1] independent experiments). B, PBMCs were mock depleted (total PBMC) or depleted of CD14+ monocytes, CD19+ B cells, or CD56+ NK/NKT cells, as described in Materials and Methods, and stimulated by SLE ICs in the presence or absence of C1q (50 μg/ml). IFN-α concentrations were quantified as in Fig. 1 and are expressed as percentage of inhibition relative to IC-alone treatment and are representative of four independent experiments. C, The IFN bioassay was performed with total PBMCs, isolated pDCs or cocultures of pDCs, and isolated monocytes (pDC:monocyte ratios 1:20 or 1:40) in the presence or absence of C1q (50 μg/ml). Results of four independent experiments are expressed as percentage of inhibition relative to IC-alone treatment (mean + SEM), as in Fig. 1. CD14-dep, depleted of CD14+ monocytes; CD19-dep, depleted of CD19+ B cells; CD56-dep, depleted of CD56+ NK/NKT cells. C1q has been shown to associate with monocytes, B cells, and NK cells, all of which express FcγRIIs that bind IgG ICs (30–32). To examine the role of these cell types, we depleted each cell type from total PBMCs prior to the bioassay and quantified the effect on IFN-α production quantified. Whereas B cell or NK/NKT cell depletion had no effect on IFN-α suppression, monocyte depletion led to a significant reduction in C1q-IC–mediated suppression of IFN-α (Fig. 4B). Similarly, normal serum was significantly less inhibitory when monocytes were removed from PBMCs in the IC IFN bioassay (Supplemental Fig. 4). To verify that monocytes were required for C1q-IC–mediated inhibition of IFN-α production by pDCs, we isolated each of these cell types (>95% purity) and cultured them together at ratios similar to those observed in total PBMCs (pDC:monocyte 1:20–1:40) together with SLE ICs in the presence or absence of C1q. Unlike the stimulatory effect of C1q containing ICs (C1q-ICs) on purified pDCs (Fig. 4A, 4C), when monocytes were coincubated with pDCs, C1q-IC–mediated IFN-α production was suppressed compared with IC without C1q (Fig. 4C). Optimal inhibition was seen at a pDC/monocyte ratio of 1:40, but a reduction in IFN-α stimulation by C1q-IC was observed at a ratio of 1:20. Taken together, these results indicate that monocytes are the cell type responsible for C1q-mediated inhibition of IFN-α production by pDCs. Monocytes can secrete IL-10, TNF-α, PGE2, and NO, each of which is known to downregulate IFN-α production by pDCs (33–36). Eloranta et al. (37) recently demonstrated that reactive oxygen species (ROS) can also inhibit SLE IC-stimulated IFN-α. To determine whether a known soluble inhibitor contributed to C1q-mediated suppression of IFN-α production, we first quantified levels of IL-10, TNF-α, and PGE2 in supernatants obtained from PBMCs that had been stimulated by SLE ICs in the presence or absence of C1q. TNF-α, IL-10, and PGE2 were either not induced (PGE2) or produced at <90 pg/ml by SLE ICs, and the levels did not increase following the addition of C1q (data not shown). A role for NO or ROS as mediators of C1q inhibition is highly unlikely, because the addition of the NO synthase inhibitor L-NG-Nitroarginine methyl ester, superoxide dismutase, or catalase had little effect on IFN-α inhibition (Supplemental Fig. 5A). To test whether other soluble inhibitors may be involved in mediating the effects of C1q-regulated inhibition of IFN-α, we collected supernatants from pDC-depleted PBMCs or purified CD14+ monocytes that had been stimulated with ICs in the presence or absence of C1q for 4 h and then washed to remove unbound ICs and C1q. Supernatants were transferred to fresh PBMCs, and then these secondary PBMCs were stimulated by SLE ICs without addition of C1q. Supernatants from the primary monocytes and pDC-depleted PBMC cultures did not alter IFN-α production in the secondary cultures (Supplemental Fig. 5B and data not shown), indicating that C1q-ICs do not induce soluble inhibitors of IFN-α. To further test whether soluble factors or cell surface ligands mediate C1q-IC inhibition of IFN-α, we set up a transwell assay. pDCs and monocytes were physically separated and stimulated by SLE ICs in the presence or absence of C1q. Separation resulted in decreased inhibition by C1q-ICs, supporting the conclusion that soluble factors are not responsible for inhibiting pDCs (Supplemental Fig. 5C). Because we observed that C1q-ICs do not cross the transwell membrane, this could also explain why pDCs in the upper chamber were chronically stimulated and therefore less inhibited because these C1q-ICs could not be competed away by the monocytes in the lower chamber (see ICs binding to monocytes below). Because the transwell experiment did not exclude the possible requirement of an inhibitory ligand, we next tested whether C1q-ICs upregulated known ligands that can suppress IFN-α production by pDCs. Although pDCs contain multiple inhibitory receptors (reviewed in Ref. 38), only a small number of ligands, such as BST-2 (39), have been identified. Flow cytometry revealed little BST-2 expression on monocytes exposed to ICs, and expression did not increase following incubation with C1q-ICs (data not shown). Similarly, neither monocytes exposed to ICs nor C1q-IC induced reporter gene expression by a BDCA-2–expressing cell line (17), suggesting the ligand for BDCA-2 is not expressed on stimulated monocytes (data not shown). Together, these results reveal that monocytes are necessary for inhibition of IFN-α production by C1q-ICs and that this inhibition is most likely explained by competition, although we cannot exclude the presence of an unknown ligand. The presence of C1q in ICs influences the physiochemical properties of the ICs and the ensuing clearance of ICs in vivo (40, 41). To investigate the mechanism(s) whereby monocytes inhibit IFN-α production by pDCs in the presence of C1q, we first examined how C1q affected IC binding to relevant cell populations in PBMCs. SLE ICs were formed with Alexa Fluor 647-labeled autoantigen (SmRNP) and incubated with PBMCs or isolated cell subsets in the presence or absence of C1q and IC binding to cells determined by flow cytometry. In total PBMCs, the presence of C1q (25 μg/ml) significantly increased the percentage (mean ± SEM) of ICs binding to both pDCs (without C1q = 3.1 ± 0.5 versus with C1q = 10.9 ± 1.2) and to monocytes (without C1q = 57.5 ± 6.9 versus with C1q = 85.4 ± 3.8), and binding of C1q-ICs never increased to >20% of total pDCs (Fig. 5A). However, the amount of ICs bound to each monocyte, as indicated by mean fluorescent intensity (MFI), was substantially higher compared with pDCs for all donors and ICs tested (Fig. 5A). We also observed a significant increase in the MFI of ICs binding to monocytes in the presence of NHS, but not HI NHS (data not shown). The presence of C1q favors SLE IC binding to monocytes. A, SLE ICs formed with Alexa Fluor 647 (AF647) –labeled SmRNP autoantigen and SLE serum (1:500) were incubated with PBMCs at 37°C in the presence or absence of C1q for 2 h and IC binding to pDCs and monocytes analyzed by flow cytometry. Representative FACS plots for IC binding to pDCs and monocytes are shown in the top panels, and percentage of IC+ and MFI for each cell type shown in the lower panels. Compiled results are shown as percentage of IC+ (compared with SmRNP-alone control) and MFI (MFI for pDCs is for within IC+ gate) and are expressed as the mean + SEM of five to nine independent experiments. B, SLE ICs with or without C1q (2.5 or 25 μg/ml) were incubated with isolated pDCs or with pDC-monocyte cocultures at a 1:30 pDC/monocyte ratio. The percentages of ICs associated with pDCs or monocytes within the pDC or pDC + monocyte cocultures are shown in circle or square symbols, respectively (% IC+). Dashed lines represent IC binding in coculture conditions. Representative results are shown from one of two independent experiments. *p < 0.05; **p < 0.01; ***p < 0.001. n.s., not significant. Because monocytes cocultured with pDCs restored C1q-mediated inhibition (Fig. 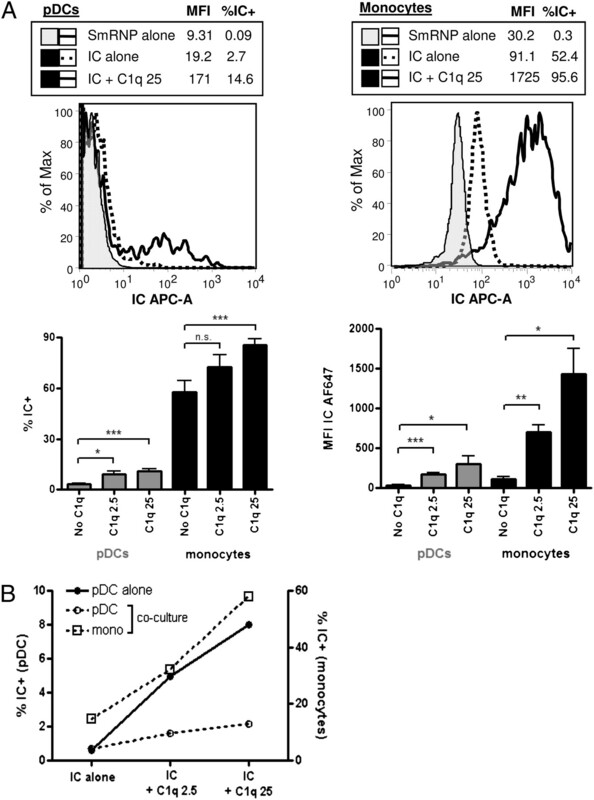 4C) and C1q markedly enhanced binding of ICs to monocytes (Fig. 5A), we asked whether IC distribution would be affected by coculture of these two cell types. As shown in Fig. 5B, C1q enhanced IC binding to isolated pDCs as expected from the results in Fig. 5A, but when the two cell types were cocultured in the presence of C1q, almost all ICs bound to monocytes and there was no significant increase in IC binding to pDCs. C1q had to be soluble to mediate the inhibitory effect because immobilization of C1q on a 96-well plate before addition of PBMCs and SLE ICs did not lead to inhibition of IFN-α induction (data not shown). Together, these data indicate that one mechanism responsible for the reduction in IFN-α production associated with the presence of C1q is to shift binding of ICs to monocytes so that fewer ICs are available to bind and activate TLRs in pDCs. To examine which receptor is involved in C1q-IC binding to pDCs, we first blocked CD32 (FcγRII), which has been shown to be the major receptor on pDCs required for IC stimulation (42). Blockade of CD32 almost completely prevented binding of ICs to pDCs even in the presence of C1q (Fig. 6A). Similarly, CD32 was required for IC binding to monocytes in the absence of C1q, but blockade of CD32 in the presence of C1q-ICs only reduced binding to monocytes by an average of 46% (Fig. 6A), indicating that C1q-ICs were binding to an additional receptor on monocytes. This receptor does not appear to be one of the described C1q receptors on monocytes because the addition of Abs to either CD93, cC1qR, α2β1, or gC1qR failed to reduce binding further (data not shown). The presence of a unique C1q-dependent receptor on monocytes that is not present on pDCs may also explain why C1q-ICs preferentially bind monocytes, leading to less IFN-α production by pDCs, as monocytes do not produce IFN-α in response to RNA-containing ICs (data not shown). C1q-containing ICs can bind to a CD32-independent receptor on monocytes and accumulate in early endosomes. A, Blocking Ab to FcγRII (CD32) or isotype control mouse IgG1 (Iso) was added to PBMCs for 45 min at 37°C before addition of AF647-labeled SLE ICs in the presence or absence of C1q. ICs were left to bind at 37°C for 2 h, and the percentage of IC+ pDCs or monocytes within PBMC cultures was quantified by flow cytometry. Results are expressed as mean + SEM of five to seven independent experiments. B, Labeled ICs, as in A, (red) were added to purified monocytes with or without C1q (50 μg/ml) for 1 or 4 h at 37°C. Abs to CD71 or lysosomal-associated membrane protein-1 (green) were added to stain early endosomes and lysosomes, respectively. Image collection and quantification of colocalization with SLE ICs were performed using an ImageStream flow cytometer. Results are expressed as the mean + SEM of three to four independent experiments. The three- to four-digit numbers on the brightfield images correspond to the specific cell image of >10,000 images acquired. We next asked whether the presence of C1q within SLE ICs altered trafficking of ICs within monocytes. Fluorescently labeled ICs were formed, as above, added to purified monocytes, and subcellular compartment colocalization quantified using an ImageStream flow cytometer. At 1- and 4-h time points, the addition of C1q significantly enhanced the percentage of ICs localized in early endosomes by 4.5- and 2.8-fold, respectively (Fig. 6B). In contrast, in the absence of C1q, the majority of ICs localized to lysosomes by 1 h and the signal decreased by 4 h, suggesting degradation. Because C1q significantly increased the binding of ICs to monocytes, we tested whether the increased C1q-IC accumulation in early endosomes could be explained by enhanced binding of C1q-ICs. As shown in Supplemental Fig. 6, when IC and C1q-IC binding to monocytes was equivalent, as determined by flow cytometry, C1q-ICs still accumulated in early endosomes such that at 4 h, 3.2-fold greater C1q-ICs colocalized with CD71 compared with ICs without C1q. Therefore, in addition to increasing IC uptake, C1q alters the way in which monocytes process ICs. The key finding of this study is that C1q suppresses the production of SLE IC-induced IFN-α through a monocyte-dependent mechanism. Furthermore, sera and cerebrospinal fluid from patients lacking C1q failed to suppress IC-induced IFN-α production, resulting in a marked elevation of IFN-α and IP-10 in these fluids. Our study provides novel evidence to explain how C1q blocks IFN-α production. It demonstrates that C1q enhances the binding of ICs to both monocytes and pDCs. When monocytes were absent, C1q augmented IC binding to pDCs and led to increased IFN-α production. However, when monocytes were present, C1q preferentially and almost exclusively promoted the uptake of ICs by these cells, leading to accumulation in early endosomes and decreased IFN-α production by pDCs. Previous studies published over the past decade have highlighted the pivotal role of IFN-α and nucleic acid containing ICs in SLE and other autoimmune diseases (43). Without the sustained production of IFN-α, uptake of ICs by macrophages or immature dendritic cells is either neutral or actively promotes peripheral tolerance (44, 45). Complement proteins, C3bi in particular, play a protective role in this regard (45). Sustained release of type I IFNs, in contrast, induces the expression of costimulatory molecules and has broad adjuvant properties (46), thus facilitating the differentiation and expansion of autoreactive lymphocytes and, in some patients, the induction of full-blown autoimmune diseases (47). The reduction in IC-stimulated IFN-α production by pDCs in the presence of monocytes could not be explained by C1q-mediated stimulation of one of the known soluble IFN-α–inhibitory factors, such as IL-10, TNF-α, ROS, NO, or PGE2 (33–37). Furthermore, transfer of cell culture supernatants did not confer IFN-α–inhibitory activity, and the addition of C1q to ICs in a transwell assay did not inhibit IFN-α, essentially excluding the role of a soluble factor. C1q-ICs did not induce monocyte expression of BST-2, the ligand for the inhibitory receptor Ig-like transcript 7 (39), nor did we find evidence for expression of a ligand for BDCA-2. These experiments revealed that the presence of C1q in ICs attenuates IFN-α production by pDCs by markedly increasing the binding of C1q-ICs to monocytes, although we cannot entirely exclude a role for an unknown inhibitory ligand expressed by monocytes following exposure to C1q-ICs. Although the addition of C1q to ICs conferred markedly enhanced binding to monocytes compared with ICs alone, binding was incompletely blocked by Abs to CD32 (FcγRII), indicating that other receptors play a role. Previously described complement-interacting proteins on monocytes, CD93, cC1qR, α2β1, and gC1qR, could not be implicated in this effect, and recent studies have questioned the C1q-binding function of some of these proteins (48, 49). In addition to enhanced binding by C1q-ICs, we also observed altered intracellular trafficking of C1q-ICs in monocytes. Whereas, in the absence of C1q, ICs rapidly trafficked to lysosomes and were presumably degraded, in the presence of C1q, ICs persisted in early endosomes for at least 4 h. The persistence of C1q-ICs in endosomes most likely also explains the enhanced IFN-α production by purified pDCs when stimulated by ICs in the presence of C1q. The endosomal location of C1q-ICs in monocytes could not be explained by increased binding to monocytes, but may relate to altered physicochemical properties (40). Precisely how this localization facilitates inhibition and whether this relates to other regulatory effects of C1q on TLR stimulation (50) remain to be determined. Most C1q in serum is bound with C1r and C1s proenzymes in serum (51), but after binding to ICs, C1r and C1s are rapidly removed (13-s t1/2) by C1 inhibitor (52). Most importantly, C1q remains bound to the ICs so that our in vitro assay accurately models the in vivo situation (53). 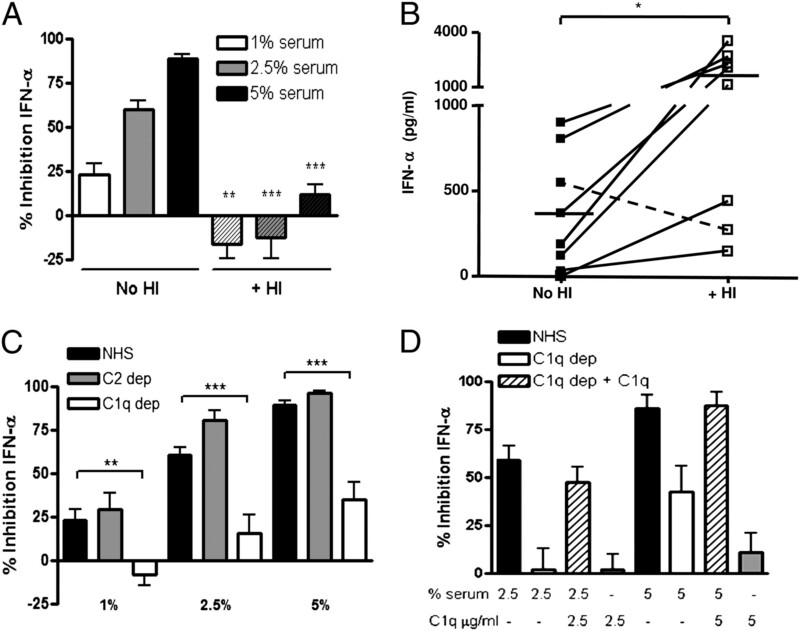 Evidence that the IFN-α–suppressive effects of C1q shown in the current report have in vivo relevance is illustrated by the elevated concentrations of IFN-α detected in the serum in patients with C1qD. In these same samples, we also detected high serum concentrations of IP-10 (CXCL10), a chemokine induced by type I and type II IFN and strongly associated with SLE (29), but not previously linked to C1qD. In contrast to polygenic SLE, in which elevated IFN-α was significantly associated with active disease, three of the four C1qD patients were asymptomatic at the time of blood draw and had SELENA-SLEDAI values of 0. C1qD patient 2 had a rash at the time blood was tested, but a SELENA-SLEDAI score of only 3, which is considered mild disease activity (11, 54). This patient has never had renal disease, which has previously been strongly associated with high IFN scores (9, 10). Less than 20% of inactive SLE patients have detectable levels of IFN-α in their serum (12, 55); thus, the detection of IFN-α protein in our C1qD patients and high serum concentrations (>20 pg/ml) in two of these patients with a SELENA-SLEDAI of 0 supports the notion that, in the absence of C1q, IFN-α responses are enhanced regardless of disease activity. C1qD patient 4 had anti-Ro autoantibodies, but low serum levels of IFN-α. We surmise that this is explained by limited Ag availability, resulting in low levels of stimulatory ICs. Patients with idiopathic SLE who develop an IFN-α signature are most likely to have autoantibodies to ribonucleoprotein particles, such as Ro/SSA, La/SSB, or SmRNP (56). Of relevance, patients with C1qD, including most of the affected family members studied in this work, predominantly have autoantibodies directed against RNP Ags rather than to DNA (57). We found that, of the 200 potential Ags analyzed by array, only anti-Ro/SSA autoantibodies correlated with serum IFN-α and IP-10 concentrations. Although the relatively small number of patients studied limits clear conclusions, this number represents a significant proportion of living homozygous C1qD patients, as <50 patients have ever been described (including our patients) and many died at an early age (58, 59). Autoantibodies to Ro were also present at high levels in the cerebrospinal fluid of patient 2 during active CNS disease associated with elevated intrathecal IFN-α. It is therefore likely that IFN-α stimulation in these patients is initiated or amplified by autoantibodies to Ro/SSA. Severe SLE in C1qD patients is frequently manifested by renal or neuropsychiatric disease (59). The one C1qD patient that had severe neuropsychiatric manifestations had markedly elevated concentrations of IFN-α and IP-10 detected in his cerebrospinal fluid, even higher than cerebrospinal fluid from neuropsychiatric lupus patients studied previously (16) or most patients with Aicardi-Goutières syndrome, a neurologic disorder thought to be caused by production of IFN-α in the brain (60). The elevated concentrations of IFN-α in the serum and cerebrospinal fluid of these C1qD patients are consistent with our in vitro data showing impaired suppression of this cytokine when C1q is lacking. Whereas inherited C1qD is very rare, levels of C1q in SLE patients vary depending on disease activity. Significantly reduced concentrations of C1q were reported during flares of glomerulonephritis, and levels of C1q, but not C4, were inversely correlated with type I IFN concentrations (5, 61). Because IFN-α downregulates C1q production by inducing maturation of macrophages and dendritic cells (62) and SLE patient monocytes had reduced expression of C1q mRNA (3), there may be a negative feedback loop in which low C1q predisposes to increased IFN-α responses to ICs. Furthermore, 30–48% of SLE patients have autoantibodies to C1q (63), which may alter C1q function. Thus, the results in the current study could have broader applications to SLE patients without a genetic deficiency in C1q. Two previous explanations for the powerful association between C1qD and SLE have been reported. Studies in mice and humans have shown that the absence of C1q is associated with impaired clearance of apoptotic cells and ICs (41, 64). A tolerogenic role for C1q was proposed by Ferry et al. (65), who observed that in C1q-deficient mice, conventional B cells undergo less efficient negative selection. Our observation that C1qD leads to defective suppression of IFN-α in response to nucleoprotein containing ICs raises the question of how IFN-α production is initiated in individuals with low C1q. There is good evidence to suggest that normal individuals are exposed to circulating ICs presumably following minor injury or infection (66) and that one function of natural Abs is to help facilitate the removal of tissue debris (67, 68). We propose that in C1q-sufficient individuals, monocytes and macrophages rapidly clear small amounts of ICs containing self Ags. However, in C1qD patients, these complexes would be less efficiently cleared by monocytes and would be more likely to engage pDCs with resulting induction of IFN-α. Once pDCs release IFN-α, this cytokine not only primes other cells of the immune system (15), it renders pDCs more resistant to C1q-mediated inhibition, as shown in this study. Combined, these effects lead to a positive feedback loop that sustains the autoimmune response, as also evidenced by the reports of SLE induced by type I IFN therapy (47). In addition to C1qD, C4 and C2 deficiency are also associated with increased risk for the development of SLE, although the risk is not as high (reviewed in Ref. 69). In contrast to C1q, we found that C2 was not required for serum inhibition of IFN-α. Experiments with purified C4 protein demonstrated that C4 alone is unable to inhibit IFN-α induced by SLE ICs or affect C1q inhibition when the two proteins were added together (data not shown). The early classical complement proteins, C1q, C2, and C4, may act in a common pathway leading to the assembly of C3bi on apoptotic cells, which we, and others, previously showed is important for the clearance of dying cells (70, 71). In contrast, because C1q is associated with a much higher penetrance of SLE, additional mechanisms such as the one shown in this work are likely to be operative. During manuscript preparation, Lood et al. (72) published that C1q suppressed IFN-α responses to ICs as well as HSV and CpG. In contrast to the studies presented in this work, they concluded that the inhibitory effects of C1q were exerted directly on pDCs, although any potential role of monocytes was not examined and all experiments were carried out with cells exposed to type I IFN. We thank Edward Clark, Maija-Leena Eloranta, Grant Hughes, Lars Rönnblom, Dan Stetson, Michael Pangburn, and Alice Wiedeman for helpful discussion; Yong-Jun Liu, Barry Coller, and Andrea Tenner for reagents; Paul Utz for autoantigen array supervision; and Amnis for ImageStream flow cytometer data acquisition and analysis. This work was supported by grants from the National Institutes of Health (AR48796 and NS065933), the Lupus Research Institute, and the Dana Foundation. This work was also supported by a Natural Sciences and Engineering Research Council of Canada postgraduate scholarship and a Kirkland scholarship (to D.M.S.).
. 2001. Delineating the genetic basis of systemic lupus erythematosus. Immunity 15: 397–408.
. 2002. C1q, autoimmunity and apoptosis. Immunobiology 205: 395–406.
. 2006. Reduced expression of C1q-mRNA in monocytes from patients with systemic lupus erythematosus. Clin. Exp. Immunol. 146: 409–416.
. 1996. Autoantibodies to the collagen-like region of C1q are strongly associated with classical pathway-mediated hypocomplementemia in systemic lupus erythematosus. Lupus 5: 216–220.
. 1985. Sequential studies of complement activation in systemic lupus erythematosus. Scand. J. Rheumatol. 14: 184–196.
. 1971. Serum complement component levels in human glomerulonephritis. Ann. Intern. Med. 75: 555–560.
. 1990. Significance of low molecular weight C1q in systemic lupus erythematosus. Ann. Rheum. Dis. 49: 698–704.
. 1969. Serial complement component alterations in acute glomerulonephritis and systemic lupus erythematosus. Clin. Exp. Immunol. 4: 191–202.
. 1999. Patients with systemic lupus erythematosus (SLE) have a circulating inducer of interferon-alpha (IFN-alpha) production acting on leucocytes resembling immature dendritic cells. Clin. Exp. Immunol. 115: 196–202.
. 2002. C1q deficiency and autoimmunity: the effects of genetic background on disease expression. J. Immunol. 168: 2538–2543.
. 2004. The role of complement in the development of systemic lupus erythematosus. Annu. Rev. Immunol. 22: 431–456.
. 2005. Autoantibodies make a U-turn: the toll hypothesis for autoantibody specificity. J. Exp. Med. 202: 1465–1469.
. 2009. Potent induction of IFN-alpha and chemokines by autoantibodies in the cerebrospinal fluid of patients with neuropsychiatric lupus. J. Immunol. 182: 1192–1201.
. 2007. BDCA2/Fc epsilon RI gamma complex signals through a novel BCR-like pathway in human plasmacytoid dendritic cells. PLoS Biol. 5: e248.
. 1982. The 1982 revised criteria for the classification of systemic lupus erythematosus. Arthritis Rheum. 25: 1271–1277. ; OC-SELENA Trial. 2005. Combined oral contraceptives in women with systemic lupus erythematosus. N. Engl. J. Med. 353: 2550–2558.
. 2007. Clinical variability and characteristic autoantibody profile in primary C1q complement deficiency. Rheumatology 46: 1612–1614.
. 1966. Methods for the separation, purification and measurement of nine components of hemolytic complement in guinea-pig serum. Immunochemistry 3: 111–135.
. 2002. Autoantigen microarrays for multiplex characterization of autoantibody responses. Nat. Med. 8: 295–301.
. 2008. IRF9 and STAT1 are required for IgG autoantibody production and B cell expression of TLR7 in mice. J. Clin. Invest. 118: 1417–1426.
. 2002. Type I interferon production by plasmacytoid dendritic cells and monocytes is triggered by viruses, but the level of production is controlled by distinct cytokines. J. Interferon Cytokine Res. 22: 653–659.
. 2006. Quantitative analysis of protein co-localization on B cells opsonized with rituximab and complement using the ImageStream multispectral imaging flow cytometer. J. Immunol. Methods 317: 90–99.
. 2009. Enhanced expression of interferon-inducible protein-10 correlates with disease activity and clinical manifestations in systemic lupus erythematosus. Clin. Exp. Immunol. 156: 134–140.
. 1981. Identification of types of cells in human peripheral blood that bind C1q. J. Immunol. 126: 1174–1179.
. 1994. Expression and function of Fc gamma RII on human natural killer cells. Nat. Immun. 13: 289–300.
. 1990. Different isoforms of human FcRII distinguished by CDw32 antibodies. J. Immunol. 144: 2295–2303.
. 2006. Macrophages and myeloid dendritic cells, but not plasmacytoid dendritic cells, produce IL-10 in response to MyD88- and TRIF-dependent TLR signals, and TLR-independent signals. J. Immunol. 177: 7551–7558.
. 2005. Cross-regulation of TNF and IFN-alpha in autoimmune diseases. Proc. Natl. Acad. Sci. USA 102: 3372–3377.
. 2006. Prostaglandin E2 is a negative regulator on human plasmacytoid dendritic cells. Immunology 119: 36–42.
. 2005. Nitric oxide inhibits IFN-alpha production of human plasmacytoid dendritic cells partly via a guanosine 3′,5′-cyclic monophosphate-dependent pathway. J. Immunol. 175: 806–812.
. 2009. Regulation of the interferon-alpha production induced by RNA-containing immune complexes in plasmacytoid dendritic cells. Arthritis Rheum. 60: 2418–2427.
. 2007. Innate immune functions of plasmacytoid dendritic cells. Curr. Opin. Immunol. 19: 24–30.
. 2009. Regulation of TLR7/9 responses in plasmacytoid dendritic cells by BST2 and ILT7 receptor interaction. J. Exp. Med. 206: 1603–1614.
. 1985. Formation of soluble immune complexes by complement in sera of patients with various hypocomplementemic states: difference between inhibition of immune precipitation and solubilization. J. Clin. Invest. 76: 2127–2133.
. 2001. Immune complex processing in C1q-deficient mice. Clin. Exp. Immunol. 123: 196–202.
. 2003. Fc gamma RIIa is expressed on natural IFN-alpha-producing cells (plasmacytoid dendritic cells) and is required for the IFN-alpha production induced by apoptotic cells combined with lupus IgG. J. Immunol. 171: 3296–3302.
. 2006. Type I interferon in systemic lupus erythematosus and other autoimmune diseases. Immunity 25: 383–392.
. 2005. Immune complex-mediated tissue injury: a multistep paradigm. Trends Immunol. 26: 48–55.
. 2005. Type I interferons (alpha/beta) in immunity and autoimmunity. Annu. Rev. Immunol. 23: 307–336.
. 1991. Autoimmunity after alpha-interferon therapy for malignant carcinoid tumors. Ann. Intern. Med. 115: 178–183.
. 2004. Murine CD93 (C1qRp) contributes to the removal of apoptotic cells in vivo but is not required for C1q-mediated enhancement of phagocytosis. J. Immunol. 172: 3406–3414.
. 2008. 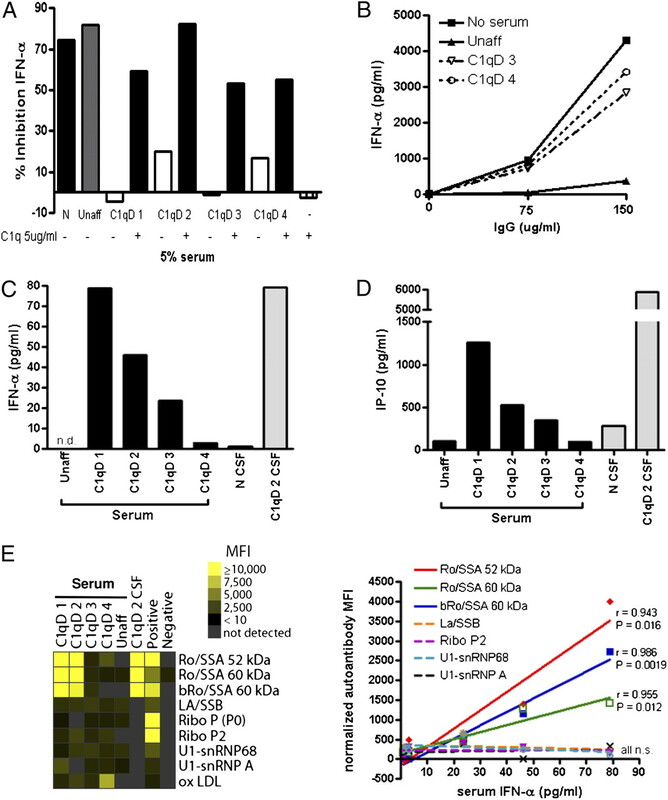 Murine low-density lipoprotein receptor-related protein 1 (LRP) is required for phagocytosis of targets bearing LRP ligands but is not required for C1q-triggered enhancement of phagocytosis. J. Immunol. 181: 364–373.
. 2005. gC1q receptor ligation selectively down-regulates human IL-12 production through activation of the phosphoinositide 3-kinase pathway. J. Immunol. 175: 4706–4714.
. 1997. The human complement C1 complex has a picomolar dissociation constant at room temperature. J. Immunol. 158: 937–944. 1981. Activation of the early components of the classical complement pathway under physiologic conditions. J. Immunol. 126: 1769–1773.
. 1979. C1 inhibitor-dependent dissociation of human complement component C1 bound to immune complexes. Biochem. J. 179: 449–457.
. 2005. Activity of systemic lupus erythematosus in end-stage renal disease patients: study in a Brazilian cohort. Am. J. Nephrol. 25: 596–603.
. 1982. Serum interferon levels in patients with systemic lupus erythematosus. Arthritis Rheum. 25: 401–406.
. 1985. Genetic deficiency of C4, C2 or C1q and lupus syndromes: association with anti-Ro (SS-A) antibodies. Clin. Exp. Immunol. 62: 678–684.
. 2007. Pediatric systemic lupus erythematosus with C1q deficiency. Ann. NY Acad. Sci. 1108: 193–196.
. 1998. C1q and systemic lupus erythematosus. Immunobiology 199: 265–285.
. 2002. Interferon and Aicardi-Goutieres syndrome. Eur. J. Paediatr. Neurol. 6(Suppl. A):A47–A53; discussion A55-A48, A77-A86.
. 2000. Activation of type I interferon system in systemic lupus erythematosus correlates with disease activity but not with antiretroviral antibodies. Lupus 9: 664–671.
. 2004. 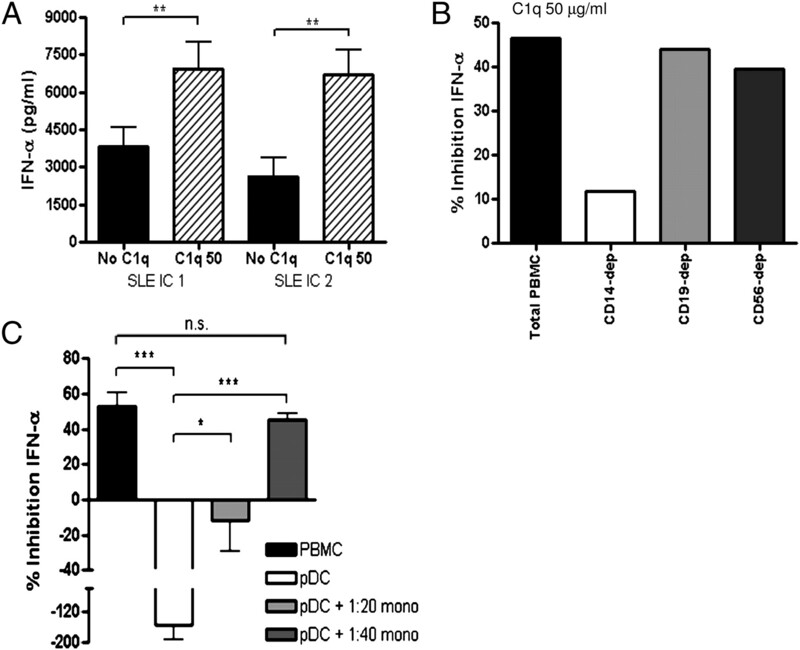 Maturation of dendritic cells abrogates C1q production in vivo and in vitro. Blood 103: 3813–3820.
. 2003. Diagnostic and prognostic significance of anti-C1q antibodies in systemic lupus erythematosus. Curr. Opin. Nephrol. Hypertens. 12: 619–624.
. 2000. A hierarchical role for classical pathway complement proteins in the clearance of apoptotic cells in vivo. J. Exp. Med. 192: 359–366.
. 2007. Increased positive selection of B1 cells and reduced B cell tolerance to intracellular antigens in c1q-deficient mice. J. Immunol. 178: 2916–2922.
. 1989. Physiological and pathological aspects of circulating immune complexes. Kidney Int. 35: 993–1003.
. 2008. Nature and functions of autoantibodies. Nat. Clin. Pract. Rheumatol. 4: 491–498.
. 2009. Organization of the autoantibody repertoire in healthy newborns and adults revealed by system level informatics of antigen microarray data. Proc. Natl. Acad. Sci. USA 106: 14484–14489. 2001. Complement: second of two parts. N. Engl. J. Med. 344: 1140–1144.
. 1998. Homozygous C1q deficiency causes glomerulonephritis associated with multiple apoptotic bodies. Nat. Genet. 19: 56–59.
. 1998. Complement-dependent clearance of apoptotic cells by human macrophages. J. Exp. Med. 188: 2313–2320.
. 2009. 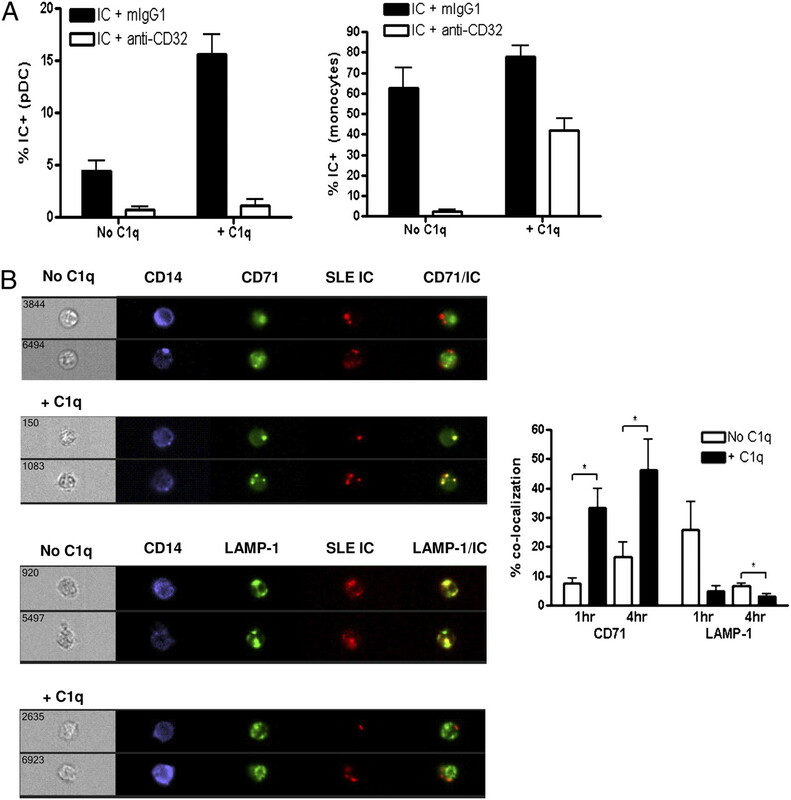 C1q inhibits immune complex-induced interferon-alpha production in plasmacytoid dendritic cells: a novel link between C1q deficiency and systemic lupus erythematosus pathogenesis. Arthritis Rheum. 60: 3081–3090.